Floes are getting thinner and thinner. There is less and less ice. And our stomachs are more and more empty. Our lives filled with white emptiness are fading away under our paws. There is nothing to eat. Nowhere to run. Who can help us? The life of polar bears is in jeopardy and we have to save them. It depends on each of us. 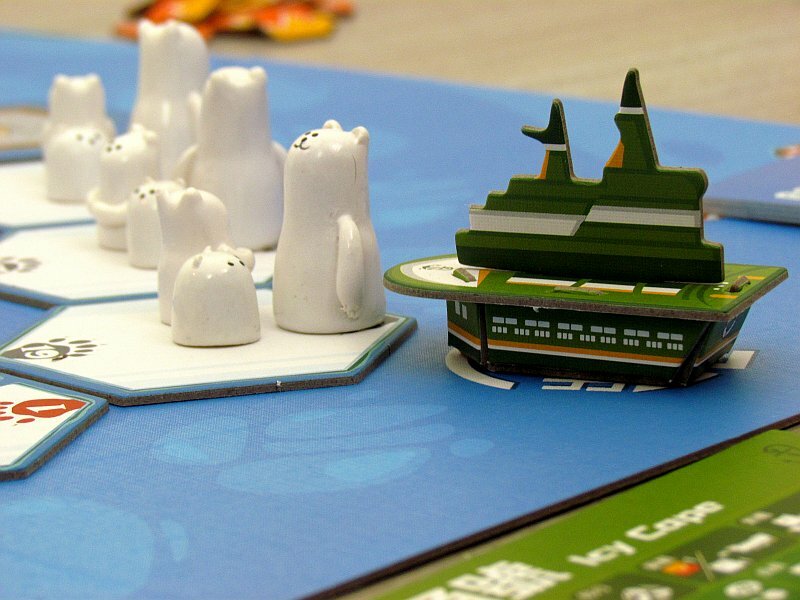 And so we can try it at least in the Rescue Polar Bears board game, created by author Darren Black and Huang Yi Ming, in an effort to draw attention to the problem of global warming and vanishing blankets of the North Pole. The illustrations were created by Collin Wang and the whole game was released in 2016 by Boxed Lightning. 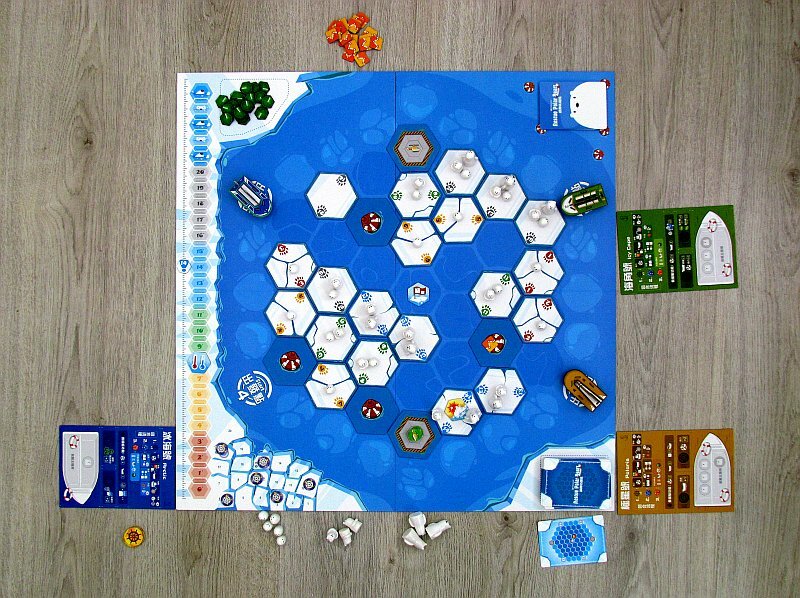 A year later, a new version with the subtitle Data & Temperature was released and was introduced at the Spiel 2017 Fair in Essen. The story takes place in year 2045, when all problems will be far more pronounced. In the light of the last few bums, people will no longer be able to say, that this is just an artificially created problem. And now, more than twenty years ago, we can look through the window into the future. On the lid, we can see some of the last polar bears, the kind the players will try to save on several fronts. 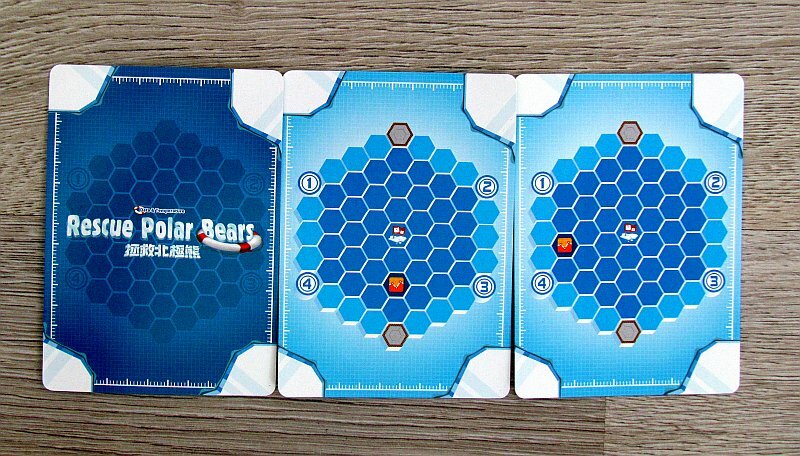 At the beginning, they place a board in the center of the table, showing a large array of hexagonal squares. 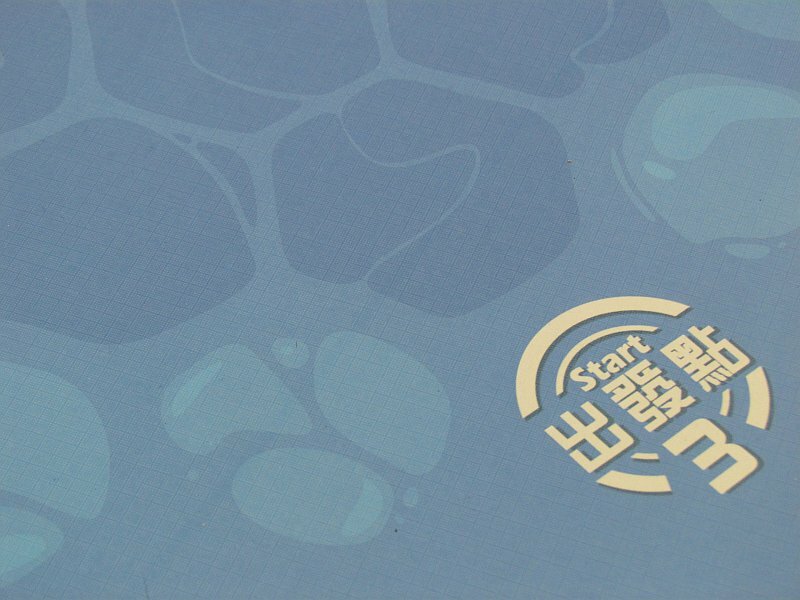 The free ocean, however, is waiting for some tiles, that the player will place in a moment. First, a complete set of thirty-one pieces must be shuffled and then randomly spread down on the map. Their casual deployment immediately reveals them, and all the open sea segments are put away. Only a few smaller and larger floes will remain on the map. 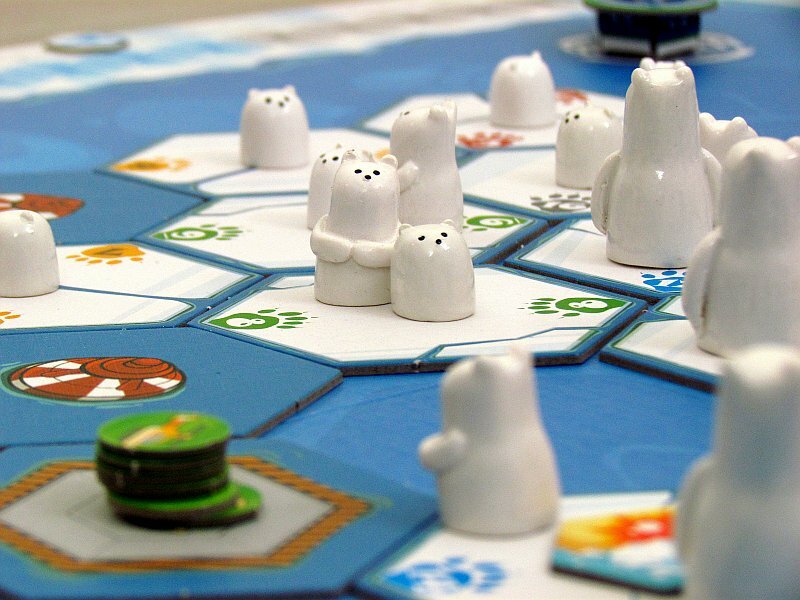 On them, according to the table in the rules, players place plastic figures of polar bears – males, females and babies. In addition, base plates are added to the edges of the water. 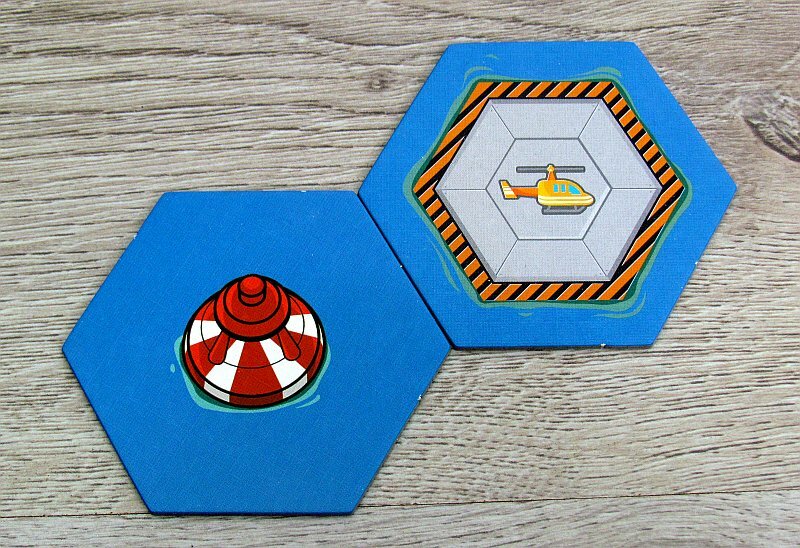 They also place cards on the board into given corners, a set of support cards, six helicopter tokens (on the base), another tokens of alarm and ice melt. On the scale of the thermometer, they mark eighth position with the help of the designated token. 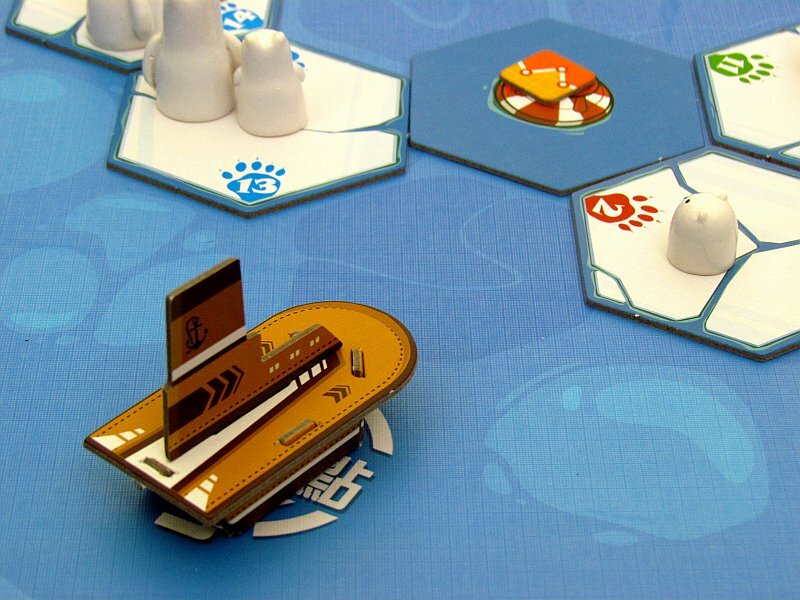 Each player then gets his own boat board and, according to his color, a carton miniature of a real lifeboat. He puts one of the starting positions in the corner of the board. The center of the entire area is marked with the location flag. Starting player gets a three action tokens in shape of a wheel. He can gradually spend one for any of four actions offered. Once player uses the entire set of tokens, he hands word to opponent on his left hand. It is possible to use them to move ship by several fields (depending on the speed of the particular vessel), but only on the open sea. If it arrives in a space with a support or data token, player can load it. In addition, the support part entitles the player to win one card. But when the ship arrives at a place, where polar bear tremble in fear, he can load it onto his ship. However, only a limited amount of bears can be loaded into the cargo area. Then player will have to travel with his cargo back, before taking another, fourth action. This is the opportunity to unload polar bears. To do so, the craft needs to be back at the base and all animals can be moved to safety for one action. 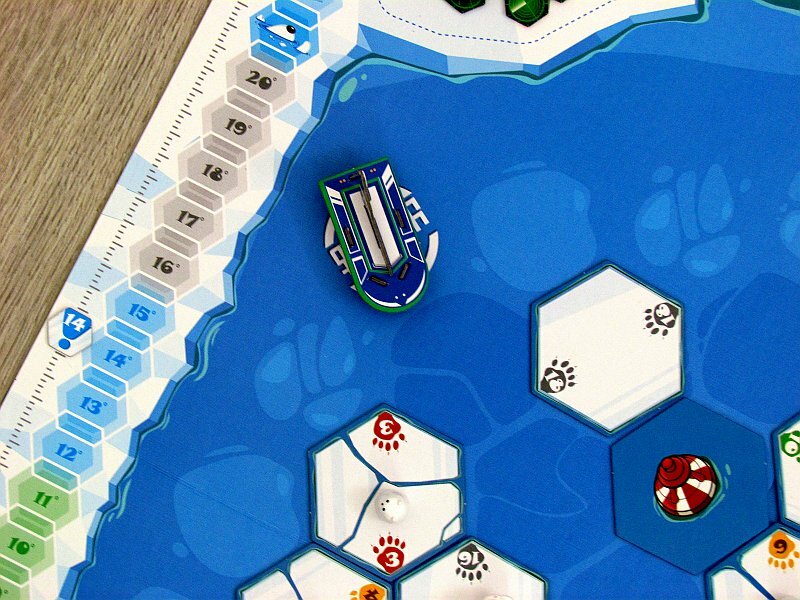 The last action available is the chance to smash one of the ice floes. 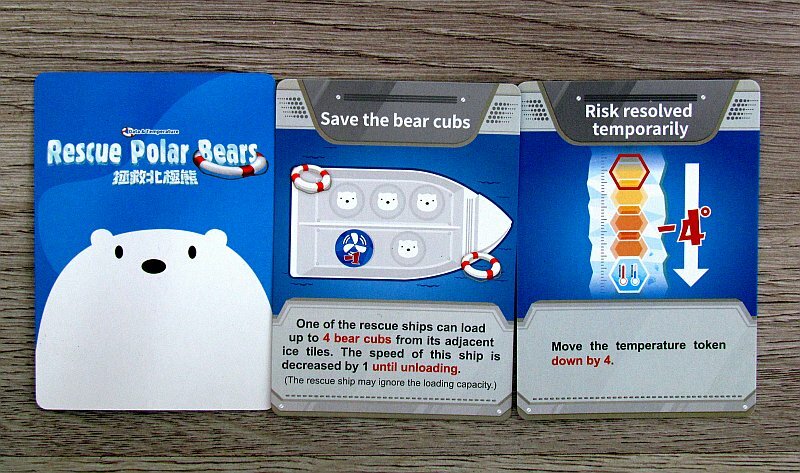 If there is a polar bear on it, the player can let him run to the adjacent box and then destroy it. As a result, players are able to zoom in on the end of the game – this will lower the value on the thermometer by two degrees. They do this because at the end of the turn, players are expecting to raise the temperature. For this, a six-sided die is used and its result will move the temperature indicator up again. 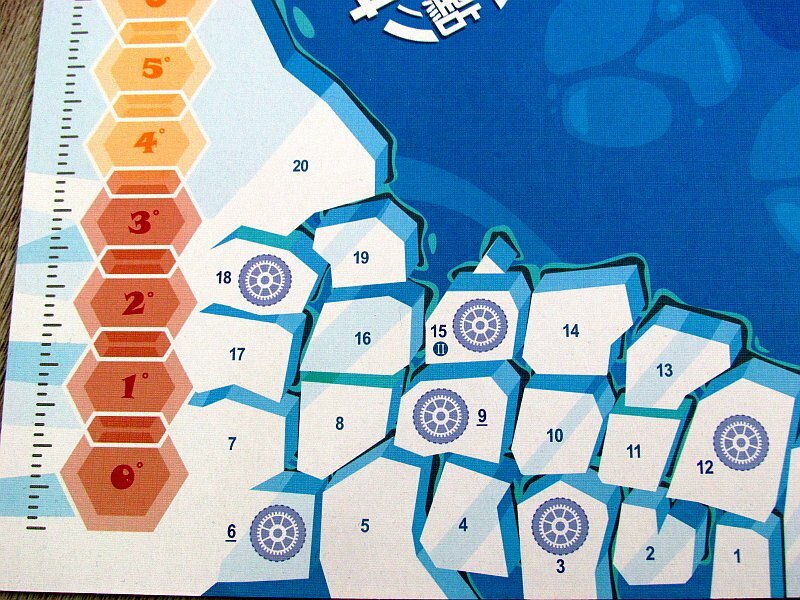 By moving on the temperature scale, players may also encounter alarm tokens, that cause further melting. As a result, player removes one circle from the map and again lowers the temperature by five degrees. However, he immediately reveals new alarm token and places it on the appropriate thermometer location. 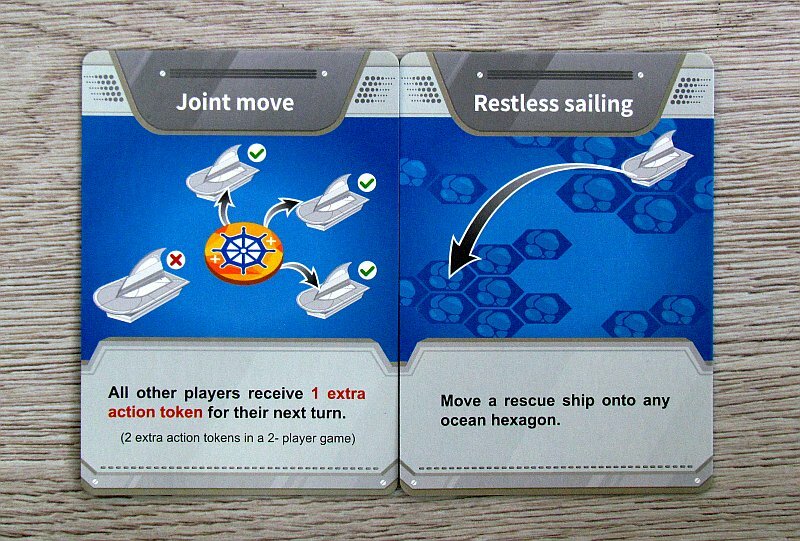 But players can also improve their ships as a result of data tokens. 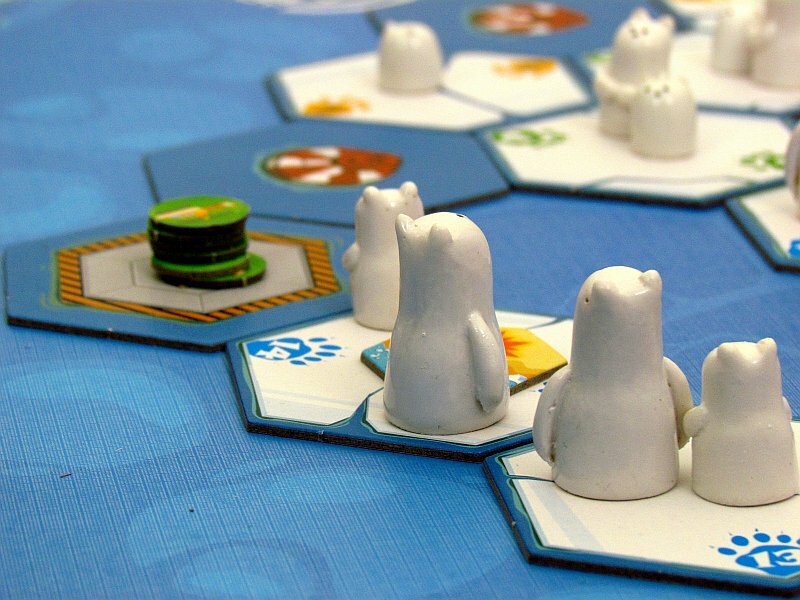 Before the player’s turn ends, the polar bear reproduction phase must be performed. For this purpose, twenty-sided dice is rolled and it will show one of the pieces of ice on the plan. 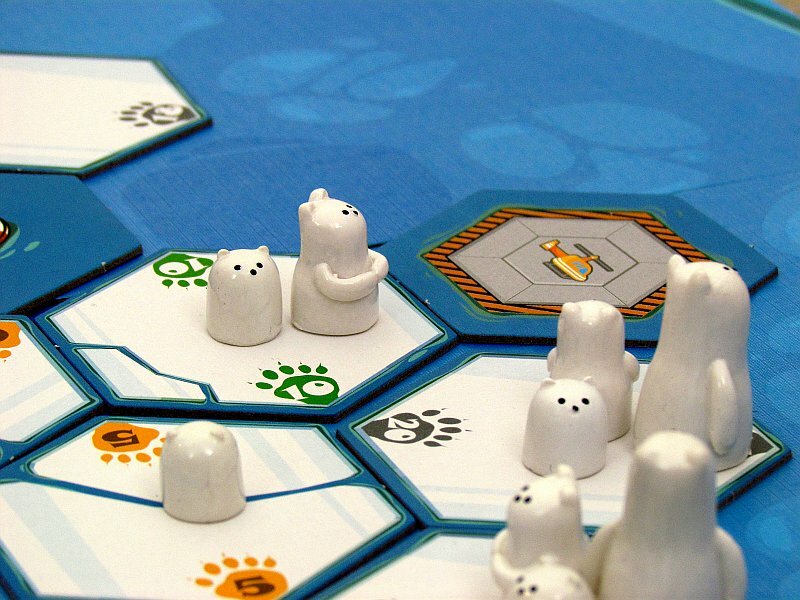 According to its inhabitants, the players will determine, what happens – new bears are born and the existing ones will grow up. However, if none of these conditions can be met, the temperature on the scale increases by one additional notch. If there are some bears stranded as a result of dissolving the ice, but they have no place to run because there are no floes in the neighborhood, then only the helicopter can save them. But this comes in a limited numbers of use. 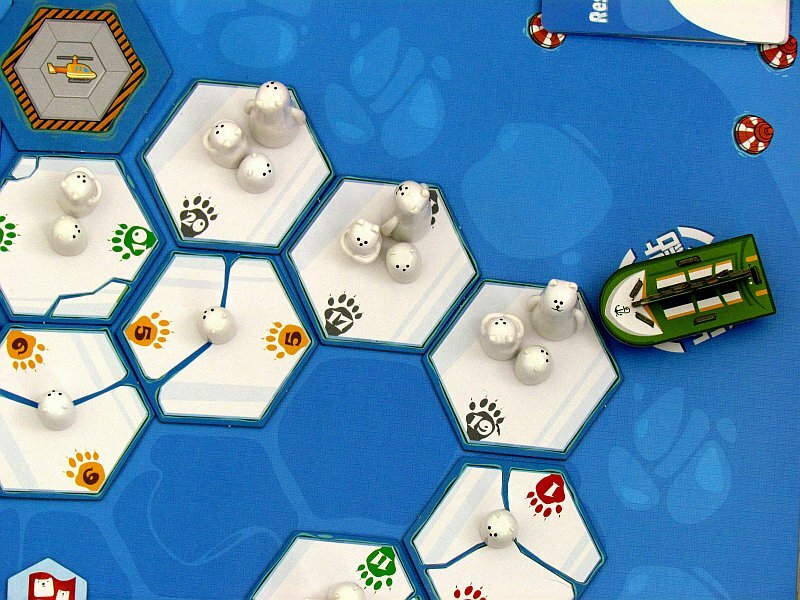 If the bear is sinking and can not be saved, the players have all lost together. 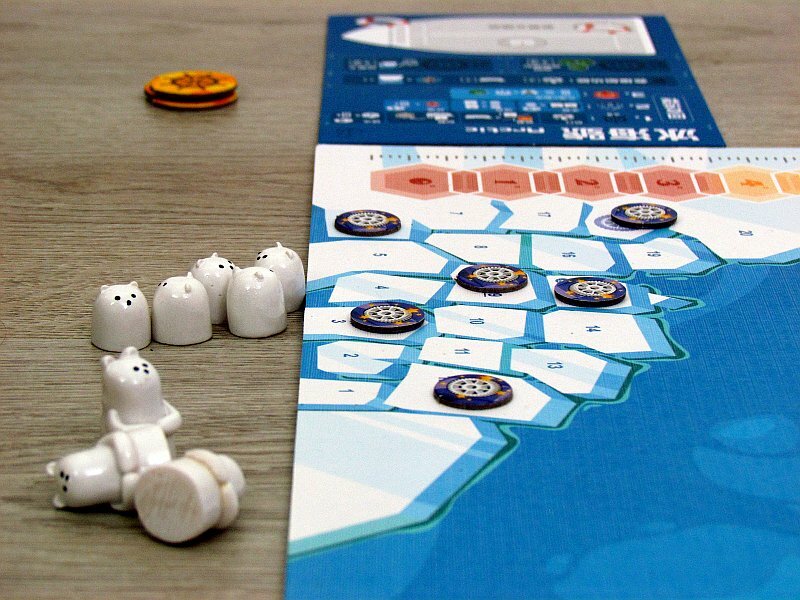 On the contrary, players try to collect data tokens together for their victory, enabling them to analyze the global warming situation. If they get enough, they can celebrate victory. 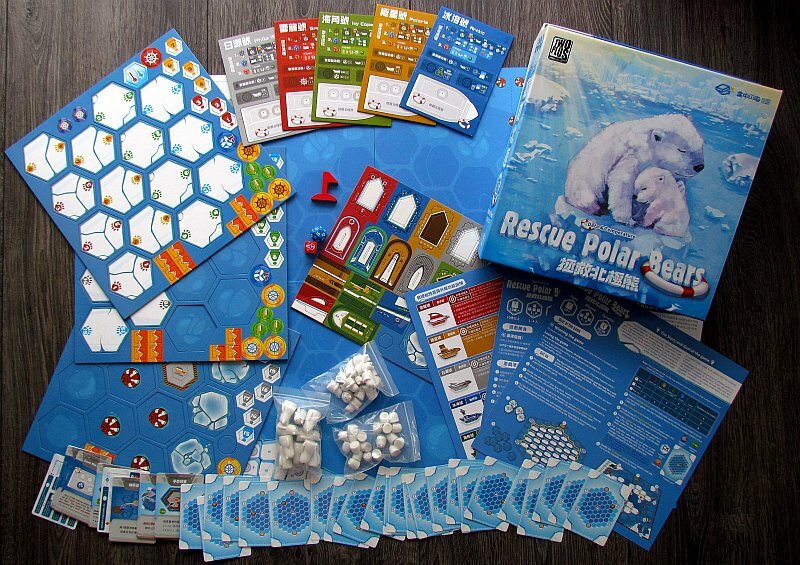 Rescue Polar Bears is an exciting ecological cooperative game, in which it is all mainly about positional gaming. There are several tasks on the map, among which they have to share their efforts. Floes disappear, no matter what they do. 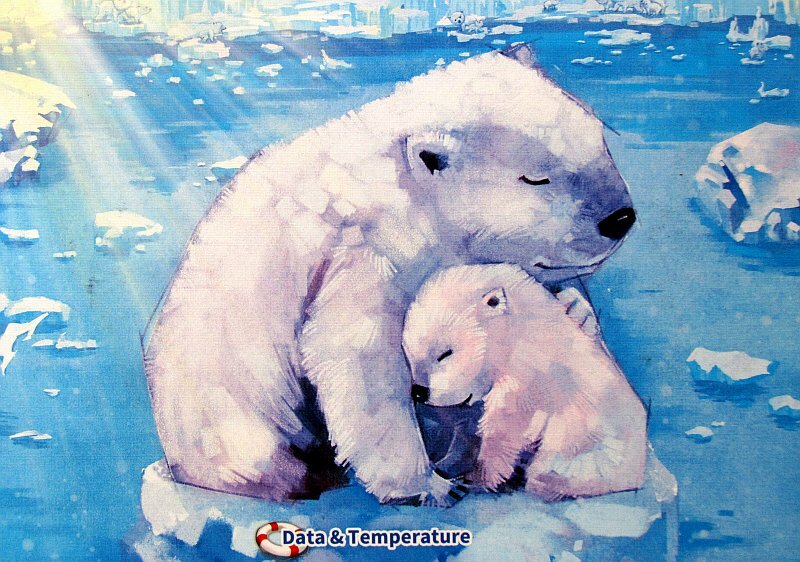 In this race with time, it is most necessary to save polar bears, but at the same time also to examine the whole problem of global warming. 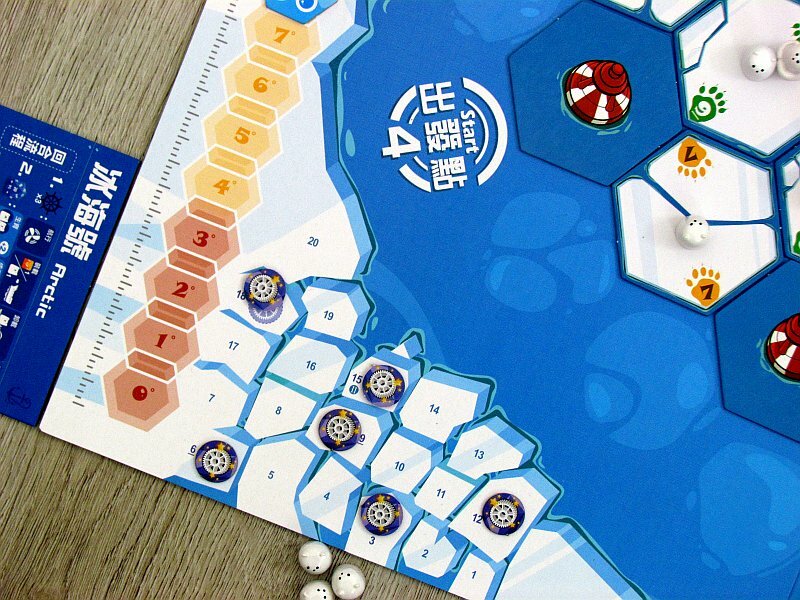 This very popular topic among public is very original to be present in board game. Of course, with this game, it is a bit of an ecological agitation to make people aware of the consequences of their actions. But no sentences are loud enough, and this game will not change anything, that is going on around us. This does not mean, however, that we can not have fun. The game is tough to beat, but it’s not even about some balance. 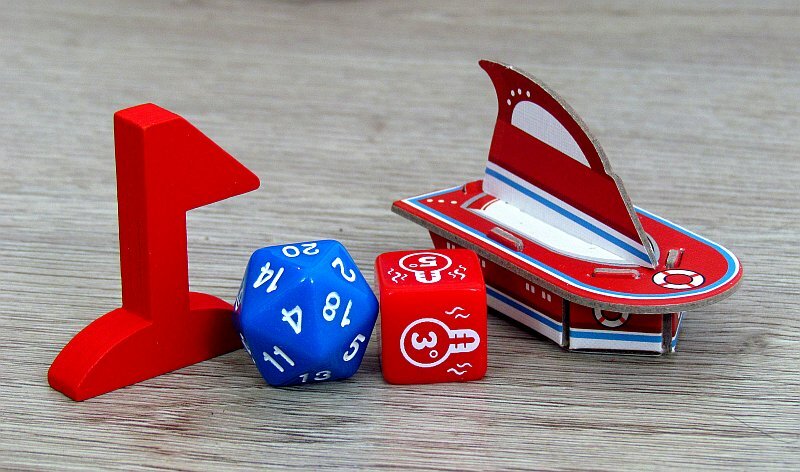 Instead, much of the success depends on the dice roll or the tokens token. A coincidence can completely destroy players’ chances or on the other hand help them. Accordingly, the individual matches are not exactly comparable between each other. It still does not matter because the game is fun. No, Rescue Polar Bears is not bad. 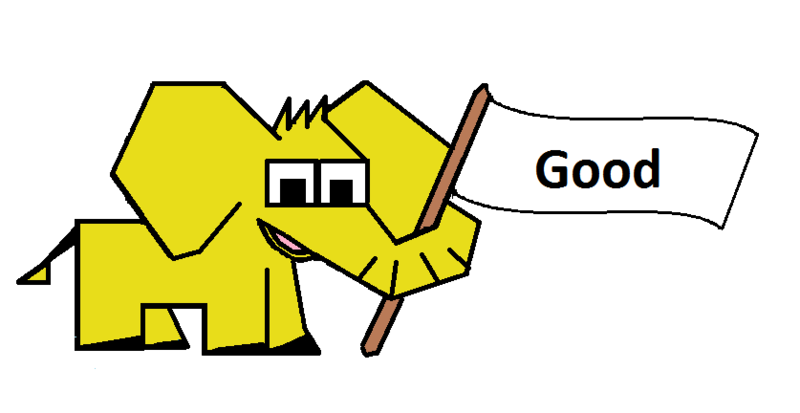 It’s a game, that works and does not contain any unpleasant surprises. Two or four players can play it and they will have nice experience, because they have to solve a common riddle. Overall, this game is about 45 minutes long. Game time together with the rules nominates this game in the family category. 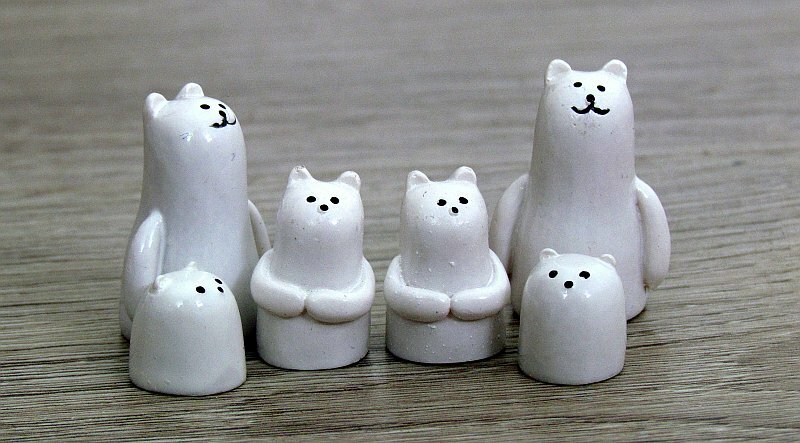 Children will surely like beautiful figurines, though they probably will not understand the background. 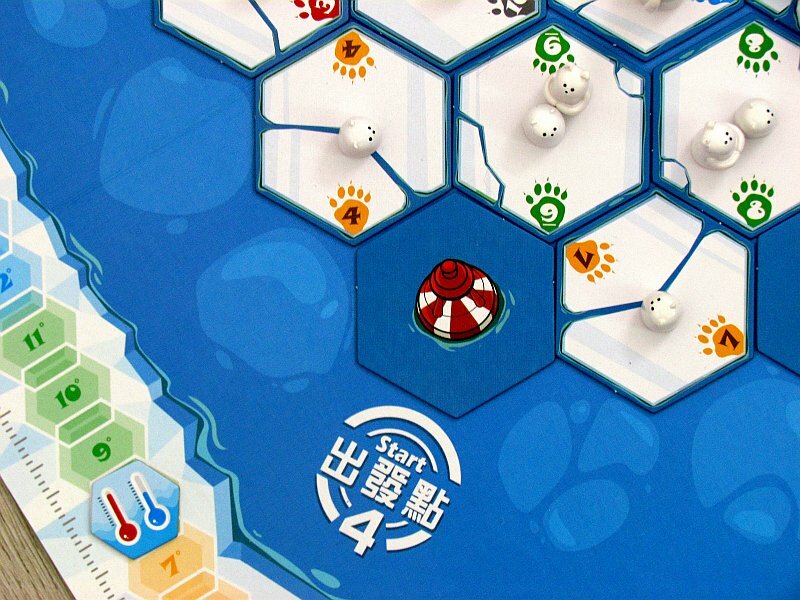 The game with temperature, melting, and last-minute rescue is consistent with the theme. Unfortunately, it does not bring any extreme strain. The whole match is simply about fighting rules and mechanisms, not a story or a common enemy. Players will be pleased with the processing. Both cardboards and polar bears are very nice. The words of praise will be scrutinized in relation to the rules. Graphics were not needed so much and perhaps, that is why it does not look exceptional altogether. 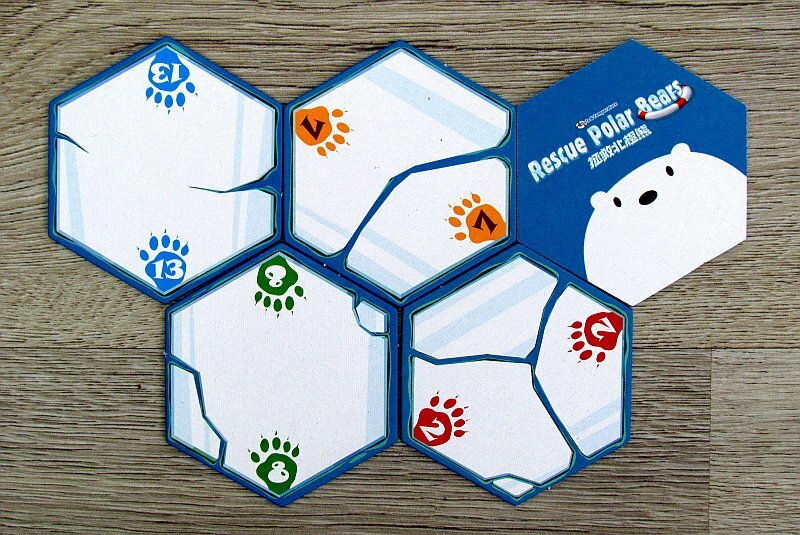 Rescue Polar Bears is a solid cooperative game, that will set players in front of a lot of hard choices. Above all, they struggle with an interesting subject, they fight for polar bears and survive the whole animal species. It is this beautiful snow-white creature, that hold it all above the water. And so there is no need to protect the game Rescue Polar Bears. 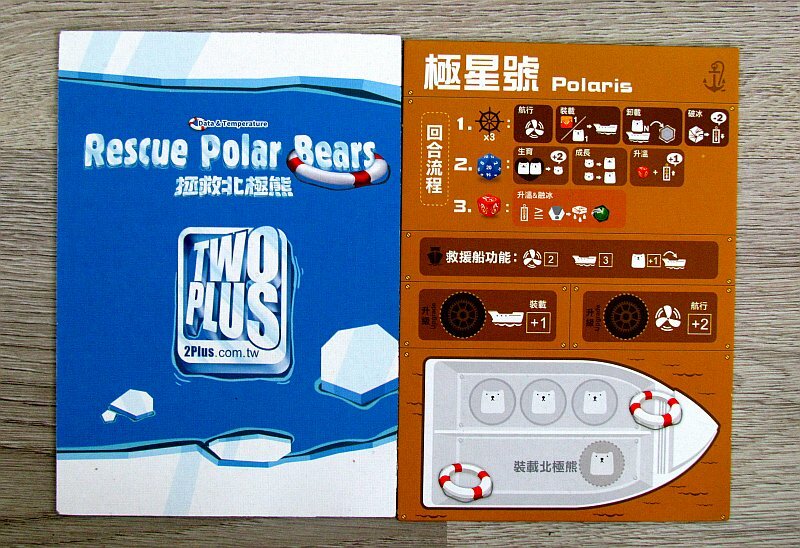 Rescue Polar Bears is an ecological fight of players against the effects of human acts. Several lonesome floes float on the sea surface and polar bears are calling for rescue. But the players also fight with the thermometer in hand. Every moment some of the floes fall apart and they have to be everywhere in time to do the saving. The game is tough and interesting, the mechanisms are definitely new. Unfortunately, as a matter of difficulty, it occasionally helps to roll dice, that can not be influenced. Even so, boating on the North Pole is an exciting experience that makes Rescue Polar Bears fun.